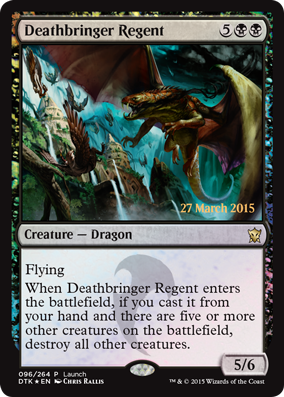 Deathmist Raptor is one of the best cards in the set… And might be THE best card in the set. Mike tries really hard to get Patrick to not like Deathmist Raptor… But is not successful. 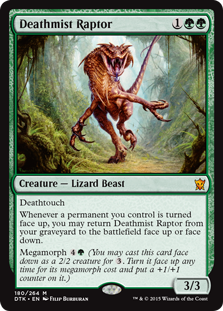 Deathmist Raptor is pretty good (not great) on rate… But it does so many other things that you will consistently make a profit on it. 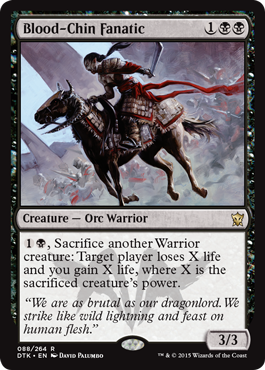 Deathmist Raptor has two green mana symbols to contribute to the “Nykthos, Shrine to Nyx” cause (and obviously works well with preexisting Devotion threats Mastery of the Unseen and Whisperwood Elemental)… Which puts the boys on the “Devotion to…” theme. 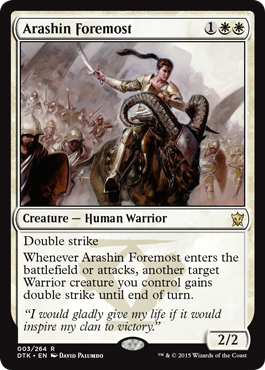 Dragons of Tarkir in many ways ushers in a new age of Devotion decks. There are many tools to set up such decks across the various colors. 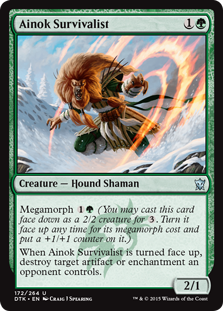 Ainok Survivalist will save many Deathmist Raptors, and even help out against a Banishing Light that MIGHT get him. With UUU in the upper-right, Shorecrasher Elemental seems tailor-made for a return to Mono-Blue Devotion. 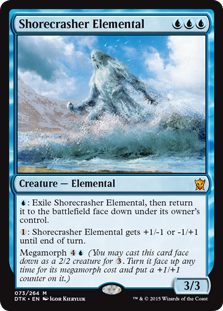 As it is an Elemental, Shorecrasher Elemental was engineered to be “the chosen one” according to Patrick… Note the Master of Waves synergy. 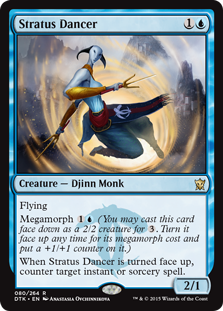 Stratus Dancer is just a great card, whether you play it in a Devotion to Blue deck or not. 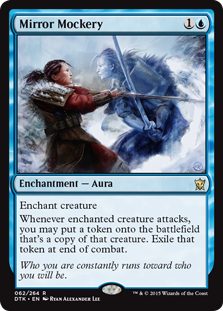 The presence of so many effective blue Megamorph cards gives Mono-Blue Devotion a lot of play, tactical implications, and a profound ability to bluff. 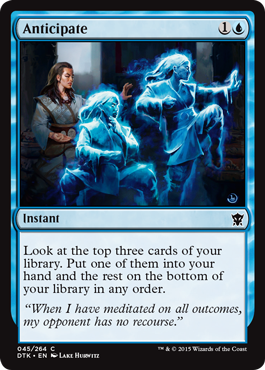 Unlike previous versions of Mono-Blue Devotion, the post-Dragons of Tarkir Mono-Blue Devotion deck will have great resilience versus removal. 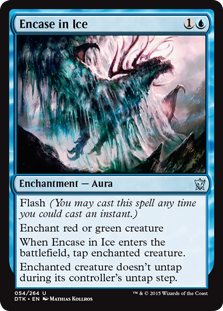 Enchantments like Encase in Ice and Mirror Mockery give Mono-Blue Devotion more ways to build Devotion to Blue outside of committing to additional creatures. 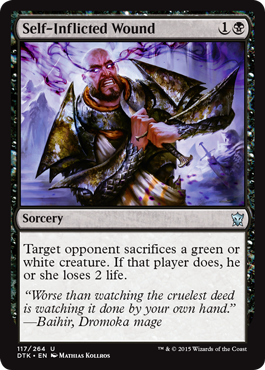 Playing Mirror Mockery on your own Master of Waves does too many good things (including double pumps during combat), plus, Mirror Mockery + Bident of Thassa is going to be just filthy. 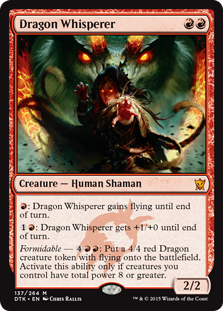 Dragon Whisperer is the flagship that pulls together Red Devotion in the upcoming Standard. 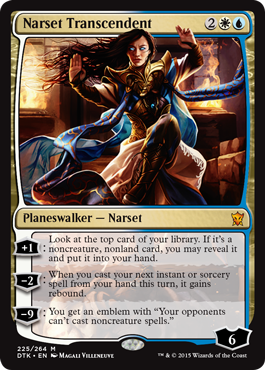 All of this plus way more Dragons of Tarkir discussion! 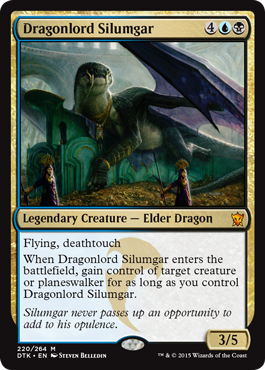 Dragonlord Silumgar is going to be a game-changer. The availability of Next Level Deckbuilding! … The answers might surprise you. 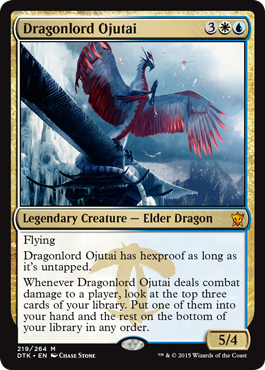 But for the next hour and a half our heroes peel back the scales of some of the preliminary Dragons of Tarkir spoilers, focusing on the dragon creatures, and one dragon in particular; an Elder Dragon, Dragonlord Silumgar. “This set is aptly named. “Do you know the set Dragon’s Maze is the first set in years with NO DRAGONS? There was one maze, though. Boltwing Marauder… Is not in the zip code of “powerful enough”. 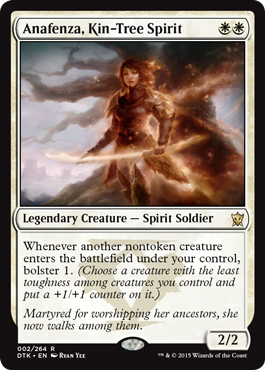 Pristine Skywise is basically the same cost as Elspeth, Sun’s Champion and Soul of Theros… Can it compete? Note: This podcast refers to Deathbringer Regent as “Deathbringer Dragonlord” and “Dragonlord’s Reaper” due to an imperfect translation. Consider this note a correction. What are you waiting for? 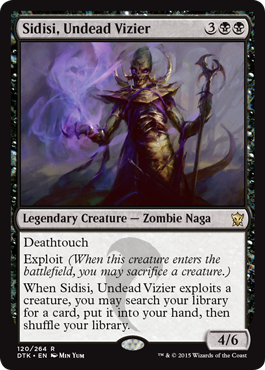 Give a listen to “(Elder Dragon) Dragonlord Silumgar & More Dragons of Tarkir” now!